Gardening gloves are not only for delicate skin; both male and female hands need that added protection. There are so many hazards that you might not even spot until it’s too late. A good pair of gardening gloves will offer protection against cuts, thorns, and any poisonous plants you might come across. What might seem a simple sting or bite of an insect, could expose you to infection. And that’s not even including the toxic rashes from poison ivy and the like! But what are the Best Gardening Gloves for Thorns and other garden hazards? In this article, we’ll look at three of the best choices around. In this article, we’ll look at three of our favorites. We’ll start with a comparison table, and then go into each option individually. Tough, but pliable Pigskin leather. Extra breathability due to the porous nature of pigskin. Padded palms and reinforced fingertips. Depending on where you buy them from, they come in “one size fits all,’ and in Medium and Large. One company is so confident with them that they offer a LIFETIME Warranty! The Garden Grip long-armed gloves are not for everyone, but they provide tons of protection. When it comes to pruning prickly rose, holly or blackberry bushes, and even dealing with cacti, the gauntlet section will protect you. They are quite robust, but are also surprisingly comfortable to wear. 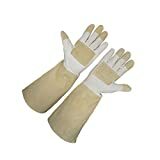 These gloves also offer protection against poison ivy, should these plants be a problem in your backyard. The pigskin leather is softer than cow or goat leather, making it more flexible. What’s more, the material is waterproof so you can rinse them off with water and they will not go hard. It is the porous nature of the leather that also keeps them breathable. No one likes hot and sweaty hands as they labor in their gloves. Many find that once they buy a pair of these gloves, they quickly amass more of them, as they’re handy to have around! The extra padding on the fingers and palms, lends added protection to those areas at risk. Even with this little extra padding, the gloves remain pliable and comfortable. The Garden Grip Pigskin Gauntlets are really great gardening gloves for those who work with thorny plants, or who have need for robust hand protection while gardening. These are the best gardening gloves for thorns around, and come with a great guarantee. And as a sweet bonus, Garden Grip are currently offering a FREE pair of smaller lightweight nitrile gloves, if you buy these gloves from them. Come in various sizes: Xsmall, small, large, Xlarge. Gauntlet shape, to protect hands and arms from prickly branches. Special stitching to allow for gripping tools. Made from natural A-grade Goat’s Leather, for extra resistance. Breathable material, so your hands are well ventilated and stay dry. As with the Garden Grip pair above, our runner-up choice is also a gauntlet-style set of goat leather gloves. This format is best for dealing with thorns, because when you are wading blindly into the overgrown prickly bushes, your arms need covering. The Legacy Garden set is made from a high-quality leather. The very nature of this material lends a natural toughness, giving excellent protection from thorns. The extra stitching around the thumb allows for easy gripping of gardening tools. This is ideal for those who suffer from arthritis, or other joint or muscle disabilities. The gloves can be used in both hot and cold climes, as they are hypoallergenic and 100% breathable. One nice thing about these gloves is that they come in four different size options, so virtually anyone can get a great fit with these gloves. Most customers find that these gloves are an excellent fit, with the gauntlet reaching as far as the elbows for protection. To give you an idea of size, the Large size measures 18 inches from the tip of the finger to the edge of the cuff. The opening circumference on the cuff measures approx. 14 inches wide on the same glove. You should not put leather in the washing machine, but you can rinse off any dirt or chemicals from poison ivy (and be sure to treat with Tecnu!). The material may go a little stiff but will soften again once in use. If you need to soften them further, try a spray of light oil, or invest in a leather conditioning cream. The Legacy Gardens goat skin gauntlets are quite solid, and offer great protection to much of your hands and arms from thorns, prickers, poison ivy, and the like. They are pretty soft to wear, and the multiple size options are a great help as well. The fact that they come with a 100% satisfaction guarantee makes them a compelling buy, and you can be sure you won’t go wrong with these gloves! Extra Padding on palms and knuckle areas. For those who prefer an elegant design, consider the RZleticc pink and black thorn proof gardening gloves. As our budget pick, they retail at under $9, making them great budget buys. They’re not gauntlet-style, so they don’t protect the forearms, and therefore offer less protection than the other two sets. They are marketed towards women, though they will work fine for many men who don’t have super large hands, and the design is pretty Unisex in our opinion. Though they come in one size fits all, they are better for a medium or larger sized hand. They are likely a little tight on extra-large hands. The RZeticc gloves are made with durable double-stitched breathable microfiber, which is great for those who are vegan or just don’t like leather. No animal skins, PVC, or nitrile are used in these products, so they’re ideal if you prefer not to use leather. The padding on the palms and knuckle areas has some elasticity. This ensures extra protection and comfort, which is nice. They are meant to fit pretty snugly, so you can continue to use your gardening tools. It’s much better to wear a pair of gloves when pruning the roses, or even weeding. And be sure to use them while raking, shoveling, or working with the compost tumbler. Avoid those nasty blisters caused from skin rubbing directly on the handle. The extra padding on these gloves provides protection from thorns. That said, some find that the material is thinner on the back of the hands, which leaves these areas less protected from damage. Those with smaller hands will benefit from the elastic in the wrist. It helps to prevent the gloves from slipping off while gardening. Once nice feature of these gloves is that they are phone-compatible. If you get a call or text while gardening, you won’t need to take these off to respond or answer. They are made with touchscreen fingertips to allow you to use your phone easily. This is not a feature everyone would want, as gardening gloves can get quite stained and dirty, but many will find it useful. The RZeticc Garden Gloves are a great choice for many, though they’re not as robust as the gauntlet-style gloves above. They’re made of microfiber, so they’re great for those who wish to avoid leather, and they’re very comfortable. 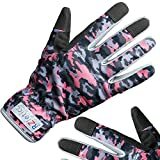 These gloves are surprisingly inexpensive, and come with a 100% satisfaction guarantee, which is always a nice feature! If your prickly shrubs have become overgrown, then you know it’s time to wade in and prune them down. That’s when a gauntlet glove protects you the most. You need the skin on your arms protected with puncture proof material, that’s why we chose the soft pigskin leather of the GardenGrip set as our top choice. Often leather gardening gloves can become hard and stiff when they get wet. Yet, pigskin remains soft and supple, even with the damp of soil and rinsing off with water. Our bargain choice, the RZeticc thorn proof gardening gloves are ideal if you prefer not to use an animal skin for your gloves. though they clearly offer less protection than the other options as they are not gauntlets. This is fine if you can see the thorny branches to avoid them. They might not be so good if you’re having to dive into a mass of prickly shrubs. If you’re an avid gardener, then you will be familiar with that aching jab that comes from being stabbed by a mature thorn. With the right pair of puncture proof gloves, you can avoid such inconveniences. Do the right thing and protect your skin as you prune and pull at those prickly branches, and get your gardening done safely!